If Santa’s presents under the tree don’t get your brood out of bed, the wonderful smell wafting from the kitchen will. Especially if you’re whipping up a fresh batch of our all-time favorite breakfast recipe: Egg Nog Spice Pancakes. They are truly filled with the flavors of the holidays such as Kemps Egg Nog, pumpkin spice, brown sugar, and Kemps Sour Cream – the only brand of sour cream produced in Minnesota. 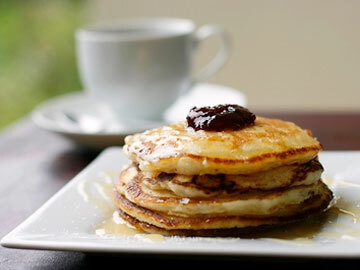 Take our word for it; these pancakes are a family tradition in the making! In a medium bowl, sift together the flour, brown sugar, baking powder, baking soda, pumpkin spice, and salt. In another bowl, beat the egg, Egg Nog, sour cream and butter until ingredients are smooth. Add the flour mixture and stir until blended, but still slightly lumpy. Don’t over mix. Pour batter onto griddle to make pancakes. When bubbles appear on the surface, turn with a spatula and cook until pancakes are brown both sides.